Afton Mountain Vineyards has long been one of my go-to wineries for entertaining out of town visitors. It’s just a short drive west of Charlottesville and the wine is exceptional. Afton was also the first winery I blogged about, but it was a sad review. I just hadn’t found my voice and this is a winery that really deserves a much stronger writeup. I was up there several times over the summer taking pictures and entertaining friends, but I wanted to stop in “officially,” do a tasting and ask a few questions. As always, it was a great visit. The Afton Mountain maxim is “grapes don’t grow in ugly places.” I’m not sure this saying is true 100% of the time, but it is accurate relative to this particular winery. The 360 degree mountain views, the old-growth vines stretching off toward the horizon and the beauty of the new tasting facility make this one of the most attractive wineries in the Commonwealth. David Medford first opened the winery under the name Bacchanal Vineyards and planted the first vines in 1998, but never produced wine commercially. The Corpora family bought the property in the late 1980s and renamed it Afton Mountain Vineyards. In 2009 Tony and Elizabeth Smith purchased the property. Under their stewardship, Afton has continued to evolve into one of the state’s premier wineries. They opened a new and much larger tasting room and doubled the acreage under vine to a total of twenty four. The additional fruit will allow the winery to reach its maximum of 5000 cases per year and then the emphasis will shift exclusively to quality. Although I must say it will be difficult to do much better than Afton is doing today. The 2014 vintage represents Afton Mountain’s 25th year of wine production. Today, there are fifteen varietals being grown and a total of thirteen different wines at Afton. The old-growth Riesling was recently replaced by Albarino, which I’m seeing more of in Virginia. Sangiovese is also being grown, which is a rare grape in the Old Dominion and is probably grown by less than a half-dozen wineries. Gewürztraminer is another of the unusual varietals being grown. It can be found around the Commonwealth, but it’s not widely grown. It is also the most popular wine and simply flies off the shelves. Making the wine at Afton is Damien Blanchon, who hails from Southern France, but came to Afton from Old House Vineyards in Culpepper. Since his arrival in 2011, Damien has had significant influence on Afton’s reputation, while becoming involved with the local winemaking community. All of his wines are extremely well crafted. I tasted six of his wines on my most recent visit. Sadly the Gewurz was not available, but the 2014 will be released for Valentines Day and I’m told that the 2014 vintage will be one of the winery's best. Among the wines I did taste, there was a Chardonnay, a Cabernet Sauvignon and a Cabernet Franc that really stood out. Each was exceptional, but the wine steward brough out a 2012 Petit Verdot that really blew the doors off of everything else I tasted. Twenty-two months in oak gave this big wine a great deal of complexity on the nose and palate. The big cherry notes gave way to a finish that just went on and on. This was a great wine and more than made up for the lack of Gewurtztraminer. Ah, Afton Mountain… The amazing tasting staff, the quality of the wine and the beauty of the property make this a winery you’ll return to again and again. Words just can’t do it justice. I will suggest that you check it out for yourself. When you do, I’d love to know what you think. Despite the fact that cideries are listed on the Virginia wine map, I turned up my nose at covering them in my blog. I had visited a couple, but considered them as “beverages other than wine." I once said the same thing about fruit wineries, but I have since done an about face and really come to appreciate them. So here I am eating my words again. I stopped in at Albemarle CiderWorks with some friends this past weekend and I was so impressed that I went on to visit a second cidery the next day (but more on that in a later post). One of the first things I learned was that the Virginia cideries are covered under the “Virginia Farm Winery Act” and classified as farm wineries. This is due, in part, to the level of alcohol, which ranges from seven to ten percent. Higher alcohol levels will classify it as apple wine. What I found even more interesting (because I’m a geek), is that they presented the cider and compared its taste profile to specific white wines. When tasting grape wine, it is common practice describe them using fruit as a descriptor. Chardonnay, for instance, frequently contains apple notes. So the CiderWorks was pouring six different ciders. Four of them were dry style ciders, one was off-dry and the last was sweet. With all of the ciders, they use a wine yeast and let it run its course turning all of the sugar to alcohol. So sugar is added back into the sweeter offerings. The CiderWorks produces an additional four ciders that were available only by the bottle. I will say that all of the ciders were of excellent quality and I was particularly fond of the dry-style ciders. There were a number of apple varieties that I have never heard of. Among them are Albemarle Pippin, Black Twig, Winesap, Goldrush, Hewes Crab, Harrison, Arkansas Black and Crab Apples… Yes, Crab Apples. These are all classic cider varietals. When a single apple type is used to make a cider, it is referred to as a single varietal, in the same way that grape wines are classified as single varietals. The tasting room is attached to the barn, but it is a thoroughly modern structure with ample indoor seating and a cute little patio area filled with tables, chairs and umbrellas. The staff was enthusiastic and eager to share their knowledge of cider. I found them to be extremely customer oriented, friendly, professional and able to answer all of my questions. So it gets high marks for the quality of the tasting experience. I should also point out that there is much more than just cider going on at Albemarle CiderWorks. You will want to check their website for the dates of the Cider Sunsets concert series. I also noted that there is a Vintage Virginia Apples Harvest Festival scheduled for November. Finally, as I was walking around taking pictures, I discovered a cute little rental cottage. It seems to have all the modern amenities combined with a lot of country charm. I can picture myself sipping cider in that porch swing on a cool fall afternoon. If you know anything about cider, which I really do not, you probably think this post is written by a simpleton. I am sympathetic to that descriptor. I had never paid much attention to cider until this visit, but I promise to learn more. If, like me, you know little or nothing about cider, then I challenge you to learn as well. If you make a stop at Albemarle CiderWorks, I am certain that the staff will bring you up to speed. I strongly recommend a visit and when you do, let me know what you think. The people of Burgundy are very likely gritting their teeth and clenching their fists in rage. They have been bested at their own game. Ankida Ridge Vineyards is cultivating the traditional Burgundian varietals, Pinot Noir and Chardonnay, with stunning success. It’s still early days for the vineyard and Pinot does not always do well in the Virginia heat, but the Vrooman Family has eked out a vineyard at 1800 feet in the rocky slopes of the Blue Ridge. The vines, which have only been in the ground since 2008, are already showing well. Articles in both Wine Advocate and Saveur heap great praise on the 2010 vintage, while both the 2011 Pinot and Chardonnay have won regional honors and great acclaim. It’s safe to say, that the Vrooman’s are in the game. Let me talk a bit about the wines. We tasted the 2011 Pinot Noir and Chardonnay, which are the premier Ankida Ridge wines and are produced primarily from the two acres of vines on the property. Pinot Noir, 2011 –This vintage recently won a blind tasting against a French Premier Cru. With characteristics more akin to Burgundy, you won’t believe this wine is from Virginia. I detected black cherry and maybe the slightest hint of cassis on the nose. There is a bit of pepper, with distinct cherry notes on the palate. I brought some home to drink and cellar. I can’t wait to see what this one is like with a little more age. Chardonnay, 2011 – I’m not often a fan of American Chardonnay, but this is not your typical American Chardonnay. Aged in neutral oak, this wine does not contain any of the buttery notes that American palates often expect. It displays a crisp aroma of citrus that leads to flavors of apple with a nice minerally finish. I’m giving it two thumbs up, because I only have two thumbs. Ankida Ridge just released a second line of wines that are produced from locally purchased grapes. The Rockgarden Cellars label consists of three additional wines. Voyage de Vert, 2012 – This Vinho Verde style wine, composed of 85% Vidal Blanc and 15% Pinot, shows crisp green apple on the nose and palate. Voyage de Rouge, 2011 – This Bordeaux blend of Merlot, Cabernet Sauvignon and Cabernet Franc was my favorite of the Rockgarden Cellars line. This wine has lots of fruit and light tannins in the finish. Vin Doux, NV – Made from 100% Chambourcin, this Port-style, fortified desert wine offers lots of big, jammy, sweet fruit with a long finish. A nice after-dinner wine. We are very thankful to the Vrooman’s, who graciously open their winery one day each month, so they can share their wine and the amazing mountain views. The perfect tasting experience involves more than just sampling new wine. It should be educational, but above all it should be fun. Ankida Ridge offered all of that in spades. Christine Vrooman greeted us at the door, poured her wines, shared volumes of information about winemaking and personally drove us up to the vineyard to show us around. This is far more than the typical tasting experience and I will forever be a fan. Starting a new winery is a risky proposition. In order to open a proper winery, investments must be made in equipment, physical infrastructure and a tasting space. That is the easy part. The cost of planting grapes averages about $15,000 per acre. Then it will be at least three years before the first harvest. It is an expensive business and owners are almost always looking for ways to make them profitable and begin to generate revenue ahead of the first harvest. Ashton Creek Vineyard planted four acres of vines in 2011-2012 and opened to the public in late 2016. Owners Kirk and Lori Thibault will release their first vintage in August of 2017. In the mean time, since they are the only winery near Chester, Virginia they are working to build clientele and get the word out. When I arrived, Lori was working with a couple interested in having their wedding on the property and a band was setting up for a concert to the rear of the event space and tasting room. They are also serving food on the premises and there was a nice crowd at the tasting bar. So things seem to be looking up for the young winery. I sat down for a conversation with Alan Thibault, who is the son of the owners and winemaker, but collaborates with his father on many of the winemaking decisions. Alan studied viticulture at Virginia Tech and his father took extension courses from U.C. Davis. For the moment, wine and fruit are sourced from a variety of sources. The first in-house vintage will be released later in the summer. The Thibault’s are currently sourcing fruit from Southern Virginia near Danville and some grapes are brought in from Washington State. Lee Hartman at Bluestone in the Shenandoah Valley and Sudah Patil at Narmada in Northern Virginia are also making some of the Ashton Creek wine. In addition, Potter’s Craft Cider is poured. There are plans to transition entirely to Virginia fruit and they may create their own line of cider, but in the interim, there is a full tasting menu with some pretty solid wines. I tasted only the wine and passed on the Potter’s Ciders. There were three whites and three reds on the menu. The whites included a Traminette and a couple of blends. I do think, for now, the whites are the real story. They were all balanced and expertly crafted. The Traminette/Viognier blend and the Chardonel/Vidal Blanc blends were both just fabulous. There was just enough residual sugar in each of them to really accentuate the fruit and each had enough acidity to ensure that they will pair well with food. Among the reds there was a very nice Chambourcin and a blend of Tannat, Cabernet Sauvignon and Blueberry. The latter is intended as a summer wine. It contained 2.5% residual sugar and was served cold. It was interesting, but I was a fan of the single varietal Cabernet Sauvignon. The Cab Sauv simply had more character. It was very fruit forward, but distinct smoke and leather notes with dark fruit and a medium finish. Ashton Creek Vineyard is just a few miles off of Interstate 95. They are too new to have a sign, but they are on the Virginia wine map, they will come up in a GPS search or directions are available on their website. If you are passing by or simply looking for something exciting and new on the wine scene, this needs to be one of your stops. After your visit, let me know what you think. Orange County Virginia is located in Virginia's Piedmont, on the western side of the Southwest Mountains. It's a beautiful drive through this part of the Commonwealth. 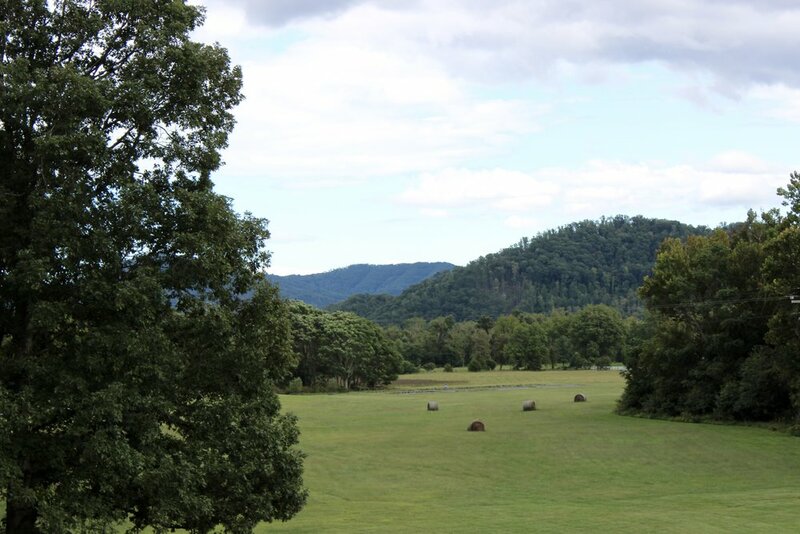 The rolling hills, horse farms and other large rural tracts have not been broken up by development. There are just a handful of vineyards in the area, but several are wineries of note. One of these, and perhaps one of Virginia's most famous, is Barboursville Vineyards. At the intersection of Routes 33 and 20 you'll find the village of Barboursville. If you've reached that junction, you're within an easy walk of the winery. The state signs are pretty reliable, but be vigilant, the gate tends to sort of sneak up on you. I've sped past it on more than one occasion and I've been there several times. 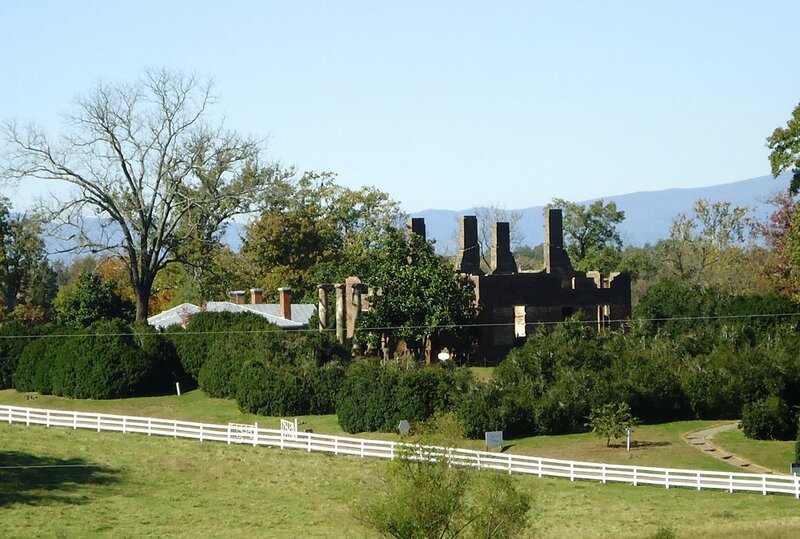 The Village and Winery both draw their name from the ruins of the Barboursville mansion. The residence was originally designed by Thomas Jefferson for the Barbour family. The home was said to be more elegant than James Madison's Montpelier, which is also in Orange County. The Barbours occupied the residence, at the center of a 4500 acre plantation until it was destroyed by fire in the winter of 1884. After the fire, the family occupied a nearby villa of Italian design, which still stands on the property as the 1804 Inn. In addition to the Inn, which is still in operation, the winery is home to the locally renown Paladio Restaurant. Paladio is known for exceptional Northern Italian cuisine, which is paired, of course, with Barboursville wines. The winery was established in 1976, in the early days of Virginia wine by Gianni and Silvana Zonin, who brought six generations of winemaking experience to Barboursville. They ignored advice to plant tobacco on the property and created one of the most significant vineyards in Virginia. 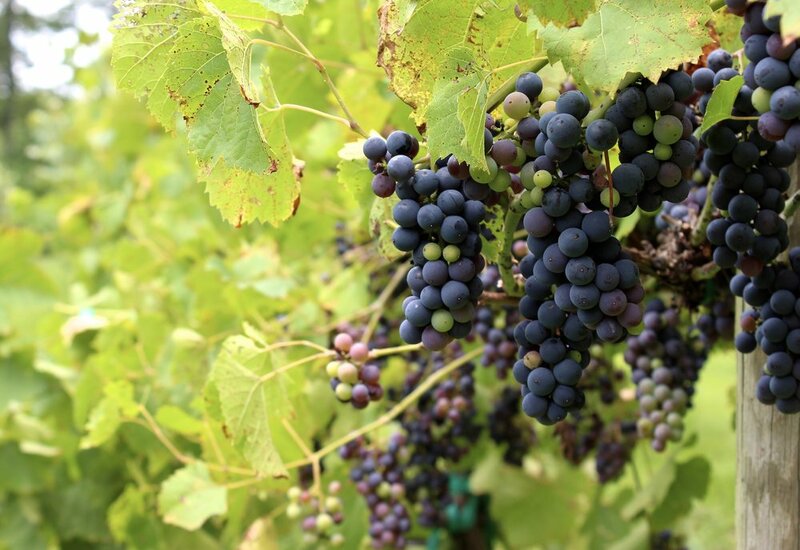 In the early 1970s, the few existing wineries were growing only European hybrids, because it was believed that vinifera (traditional European varietals) could not thrive in Virginia. The Zonins ignored conventional wisdom and proved correct in their assumption that vinifera could be cultivated. This gamble contributed directly to the current success of the Virginia wine industry. Barboursville wines have received both national and international acclaim. The vineyards and winery produce exclusively Italian and French varietals of exceptionally high quality. The winery currently produces about 35,000 cases per year from vines on the property and from grapes sourced locally in the AVA. Quantity has had no impact on quality. Barboursville is producing some world-class wines. I could go on at length about the wines, but I'll try to focus on my favorites. On my most recent visit whites on the tasting menu included the Sauvignon Blanc, Chardonnay, Pinot Grigio, Vermentino, Viognier and Riesling. The 2010 Viognier was exceptional, but the 2012 Riesling took me by surprise. It was off-dry and had big pineapple notes with a clean finish. There were too many reds to list them all. The Bordeaux blend, Octagon, is Barboursville's signature wine and has won the most acclaim. Sadly they weren't tasting it on this particular day. My overall favorite was the 2012 Cabernet Sauvignon Reserve. The Cabernet had a great nose and lots of black fruit on the palate with a very long finish. It has the legs to go many more years on the shelf. It's a great wine. Let's face it, Barboursville is well known and the quality wines combined with the historical significance of the property tend to draw a crowd. 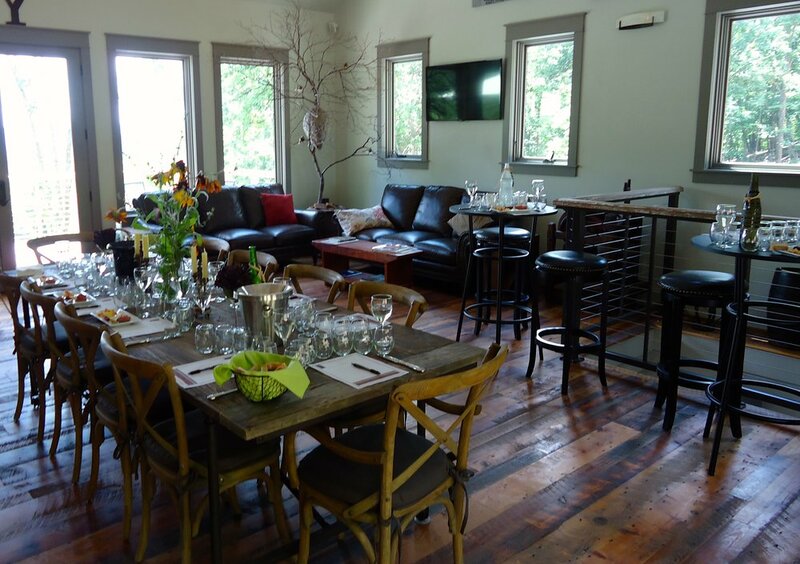 In an effort to disperse the number of visitors, the tasting room has been divided into a number of tasting stations. Each of the six stations contains a number of different wines. There is a separate tasting bar for whites, Italian reds, French reds, Octagon, Reserves and dessert wines. As a result, you can end up waiting for a tasting six times. I guess you can wait in one long line or six short lines, so perhaps it breaks up the queue. In any case, it's worth the wait to try the wines, so don't be discouraged. Virginia history and the history of Virginia wine converge at this one venue, which makes it a must-visit winery. Of course the wines are reason enough to visit, but the variety of attractions make this more than just a tasting experience. Anyone serious about exploring Virginia wineries will have to make a stop at Barboursville. Blenheim Vineyards is about twenty minutes from my house. It get’s a lot of attention, because it’s owned by Dave Matthews. I suppose that many people visit because they are fans. I also get the sense that, for many oenophiles, there's a certain stigma associated with “celebrity” wine. It’s frequently assumed that the rich and famous are motivated by some prestige-driven desire to have their names attached to a winery. Maybe it’s the “thing” to do. Brad and Angelina are producing wine. So are Drew Barrymore, Antonio Banderas, Jeff Gordon and ACDC for crying out loud. So with that lead in, you might think this is going to be a negative review of Blenheim, but you’d be wrong. Frankly, you’ve got to have significant disposable income to invest in a winery and that’s the real common denominator. Most winery owners in Virginia were successful at something else before becoming involved in viticulture. Celebrity draws public attention, but has little to do with the quality of the wine or the tasting room experience. At the end of the day, it comes down to making the right decisions and assembling a good team. I don’t know who’s making the decisions at Blenheim, but Dave Matthews is not putting his money into a frivolous, poorly run venture. When you arrive at Blenheim, you’ll immediately be struck by the architecture of the winery building. It’s a very large and attractive A-frame structure. The tasting room door is at one end and upon entry, you encounter a long open cathedral-like space with the tasting bars against the large A-shaped window at the far end. The exposed rafters and ceiling joists provide additional accent and railings are installed around an opening in the floor that allows you to look down into the barrel room. Frankly, I would drive out just to see the building. The winery/tasting room was constructed in 2001, which was about a year after the first vintage was bottled. As of this writing, Blenheim produces between 6000 and 8000 cases of wine were produced from its seventeen plus producing acres. There are a total of 30 acres under vine. Even after those additional acres begin to bear fruit, Blenheim will remain a boutique winery. The emphasis will be on small-batch, well-crafted wines. Charged with producing these wines is one of the area’s most famous winemakers. Kirsty Harmon learned her craft from Gabriele Rausse, who is arguably the most influential and important winemaker in the Commonwealth. She also earned a degree in enology at UC Davis and apprenticed in Burgundy and New Zealand. So Harmon brings a range of real experience to the task and it shows in the tasting room. There were five wines on the tasting menu during my most recent visit. They are all quite good, but I want to talk about the signature wines, which are the Blenheim Painted White and Painted Red. The labels are designed by Dave Matthews and despite the fact that they probably make great souvenirs for the many visiting fans, they’re actually very good wines. The 2012 Painted White is a blend of Viognier, Roussanne and Marsanne, that spent 10 months in French, American and Hungarian oak. It’s a dry white, with melon notes and a nice crisp acidity. The 2012 Painted Red is a blend of Cabernet Franc, Merlot, Petit Verdot, Cabernet Sauvignon and Mourvedre. It has a beautiful nose of black fruit and more black fruit on the palate. It’s still a young wine and is showing a bit of tannin, but real structure. It was my favorite of the tasting and a potential award winner. With a few more years in the bottle, it will be an exceptional wine. I’ve always found the staff at Blenheim to be first rate and this trip was no exception. Sarah, my wine steward, came to Virginia as part of an agricultural exchange program. She worked in the vineyards for a time and stayed on in the Charlottesville area pitching in at the winery most weekends. She was very laid back and knowledgable about the offerings. The tasting was just part of a larger conversation, during which I learned a lot about the wines and the winery. I thought it was a delightful and very well structured tasting, so kudos to Sarah. The bottom line is that I won’t send you out to Blenheim just because it’s a celebrity winery. I will, however, recommend it for the quality of the wine, beauty of the architecture and the tasting room experience. If you’re a Dave Matthews fan, that's fine, but there are many other reasons to visit. Clyde Bodie is a seventh generation decendent of Huguenots, who fled religious persecution in their native France. After Abraham and Susanna Michaux arrived in the Americas in the early 1700s, they received a series of land grants from the English crown in what is now Powhatan County, Virginia. Clyde’s current property is a just a few miles removed from that original tract. Clyde has been around wine since he was five years old. As of this writing Clyde is 86 and he speaks fondly of how his father made wine from Dew Berries growing wild on the family farm. You might say the craft was in his blood, when years later Clyde started making wine from produce on his Powhatan County farm. He used everything available from apples to dandelions, but he also planted grapes. As early as 1972, he began experimenting with French-American hybrids that were developed at Cornel University. Clyde planted an acre of Cayuga and Buffalo. Several others were experimented with over the years, but they failed to thrive in the local red clay soil. He made small batches of wine for family consumption. Well, maybe not so small. So much wine was produced, that consumption failed to keep pace and he soon ran short of storage space. The family strongly urged him to apply for a farm winery permit and try to make a little money from his hobby. He jumped through all the hoops and in 2008, Bodie Vineyards produced it’s first vintage. Although the trees still stand near the tasting room, Clyde has long since given up on fruit wines. The acre of grapes results in around 200 cases annually and that’s currently the upward production limit. Some recently planted Foche (which I believe is technically Marechal Foche) was added as an additional varietal. There are plans to use the grape for blending. There are also plans to add another three acres of vines. When pressed on when the planting might take place, all Clyde would say was “not this Fall.” So we’ll have to wait and see how things develop in the coming years. There are only two wines currently produced. The Michaux Blanc is 100% Cayuga and the Rochette Rouge is 100% Buffalo. Both are done in a dry style. If the plans for additional acres under vine come to pass, there will likely be some blends and there was talk of a Cayuga sparkling wine. It’s worth a trip out to see what’s going on at Bodie Vineyards. It’s a small operation, but the wines are well made and you simply don’t find many of these hybrids elsewhere in the state. In addition, some of the Bodie vines are nearly 45 years old. And you won’t find that anywhere else in the Commonwealth. So I’d say this is a pretty exciting discovery. Stop in and let me know if you agree. I do not think it is accurate to say I am on a cider kick, but I have visited a few local cideries of late. So last Sunday I decided to visit one more. Bold Rock Cider is in Nelson County on Route 151, which is home to a local beer trail, a distillery and some of the state’s best wineries. There is a lot happening in and around the village of Nellysford and more than you can take in during one excursion. Unlike the boutique cideries I visited in Albemarle County, Bold Rock is a major producer. One need only look into the production area and check out the size of the fermentation tanks. The shopping space inside the tasting area is filled with more than t-shirts and other swag. Cases of cider are piled high, chilled bottles are in the coolers for purchase and growlers are lined up shelves. I do not know what the annual production levels are for this cidery, but they certainly appear to be a major player and I do see Bold Rock cider in all the local stores. From the parking lot, you must ascend a long ramp to the tasting room entrance. It is hard to get a real sense of the place from down below. Even standing in front of the large red “barn-like” structure, the only observation I could make was that the place appears to be pretty large. Inside is another story. It is spacious shopping and a cashier just inside the door. Beyond that is the tasting bar, where free tastings are offered. I will say that only two featured ciders can be tasted for free. It is necessary to purchase a flight, in order to taste the others. Unlike the other local cideries, Bold Rock ciders are not bone dry. Every one of the offerings has some residual sugar, although the two off-dry ciders contain only enough sugar to be detectable. There are a total of six ciders. I was particularly fond of the Vintage Dry, which is a Prosecco-style cider with just 2% residual sugar. My other top pick was the IPA (India Pressed Apple), which is a west-coast style hopped cider full of citrus and Granny Smith notes. Of course there is something on the menu for everyone. 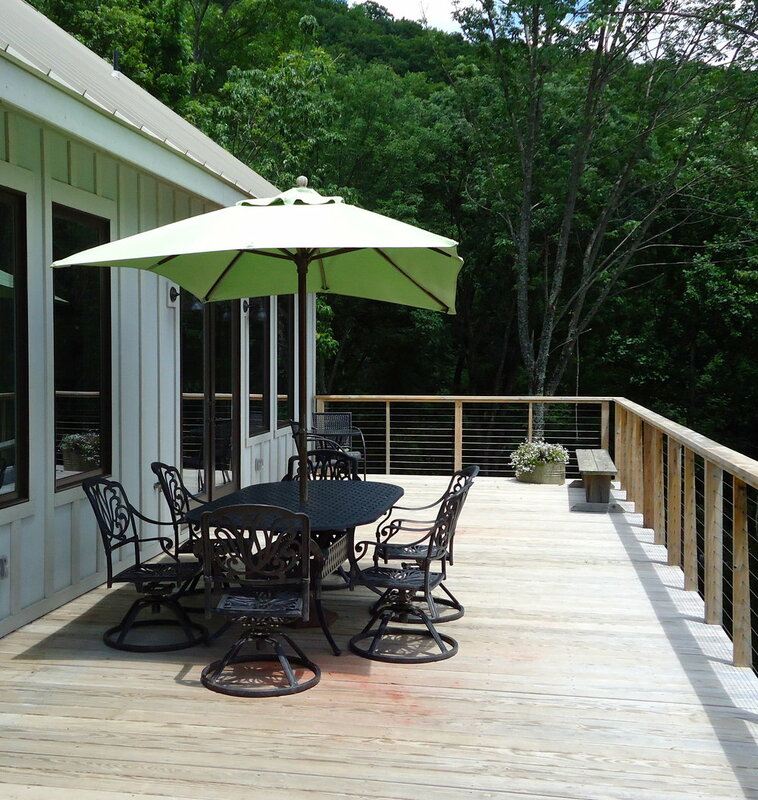 The main event is the series of decks and patios to the rear of the building. This is where you will want to retire with your flight or glass of cider. From that vantage point, you will find amazing views of the Rockfish River as it meanders through valley below. It is a stunning view and one you will likely return to see a second and third time. Granted, there is a lot to do in Nelson County, but if you can fit in a visit to Bold Rock Cider, I think you will be happy you did. I would love to hear what you think. Last time I stopped at Brent Manor Vineyards, I found owners Jorge and Tracie Raposo working behind the bar. The grand opening had not yet taken place. There were obvious signs of continuing construction around the property and there was little infrastructure beyond the tasting room. If we fast-forward a couple of years to my most recent visit, Jorge and Tracie were still behind the bar, but there were many other signs of change. Seating on the hillside takes advantage of the stunning mountain views. A small stage has been completed at the bottom of the hill to accommodate music. The porch is completed and offers outdoor seating and the wine program has matured. The Raposos spent time looking at several properties before settling on their current location in 2009. Land was cleared, grapes were planted and the tasting room was built. They opened their doors for business in late 2015, but they are forced to source all of their fruit. Predation, primarily from deer, has decimated their vines. Until they are living permanently on the site, Jorge does not anticipate success in the vineyard. In any case, they are pouring wine. Last time I visited, there were only two Brent Manor wines on the menu, so the tasting was rounded out with Gabrielle Rausse and Portuguese wines. This time there were six Brent Manor wines and three from Portugal round out the lineup. All of the wines are available for purchase in the tasting room. Jorge grew up on Portugal in a region where nearly everyone grew grapes and made wine. So winemaking is simply coded into his DNA. I found all of the Brent Manor wines to be well crafted, but Jorge is limited to the Virginia fruit available for purchase. There was a Sauvignon Blanc made from Washington grapes that was quite good. Two Brent Manor summer wines were made from Virginia fruit. A very fruity blend of Traminette, Niagara and Viognier displayed the grape juice aromas of Niagara, but the palate was not dominated by that varietal. The Chambourcin-Viognier blend is best served chilled and seems appropriate as a picnic wine. The two Brent Manor wines with the most substance were the single-varietal Chambourcin and the Chambourcin-Cabernet Franc blend. The Chambourcin in particular illustrated Jorge’s skill. That full-bodied red was complex, with rich fruit and hints of tobacco. Based on the quality of these two wines, I am very interesting to see what Jorge can do with his own estate fruit. I really encourage you to get out and support Brent Manor and I strongly recommend visiting soon. I am certain that you will love the view. On top of that, Jorge and Tracie are extremely enthusiastic, friendly and welcoming. Finally, the lineup of wines is certainly worthy of exploration. So what are you waiting for? After you stop in, please let me know what you think. Dean Vidal met me as I approached the end of the long farm lane that leads to the house and small grouping of out buildings near the center of the property. Dean is a retired naval officer, whose interest in wine began in the late 1980s, while he was still living in Alexandria, Virginia. He began by experimenting with a small number of vines, he’d cultivated in his yard. He also made small quantities of wine for personal consumption. This was the beginning of a path that led him to Brightwood Farm in rural Madison County, Virginia. Dean directed me to a circle of a half-dozen chairs arranged under a large shade tree and then disappeared briefly. When he returned, he was carrying a small crate filled with wine bottles. He took a seat opposite me and once again welcomed me to his farm. Without any further introduction, he pulled an unmarked bottle from the crate, poured me a glass of wine and said, “Cheers!” After giving me a moment to reflect on the wine, he urged me to guess what I was drinking. It had no idea. It was well structured and had a nuanced grape-wine signature, but it was unlike anything I’d ever tasted. Was it some obscure hybrid? Now I should point out that Brightwood is an organic farm. Wine is a very small part of the total operation. Dean and his wife Susan sell jams and jellies, organic vegetables and pastured eggs, as well as lamb and goat meat in season. When I said wine was a small part, I meant small. Current production is somewhere between sixty to eighty cases of wine each year. This is smaller than the smallest boutique winery I’m aware of. Nevertheless, they have a farm wine license, which allows them to advertise and sell what they produce. Some of the Brightwood offerings are made from hybrid grapes, that are primarily from the Concord family, but most are fruit wines. At best, I can only identify a small number of varietals from taste or smell. 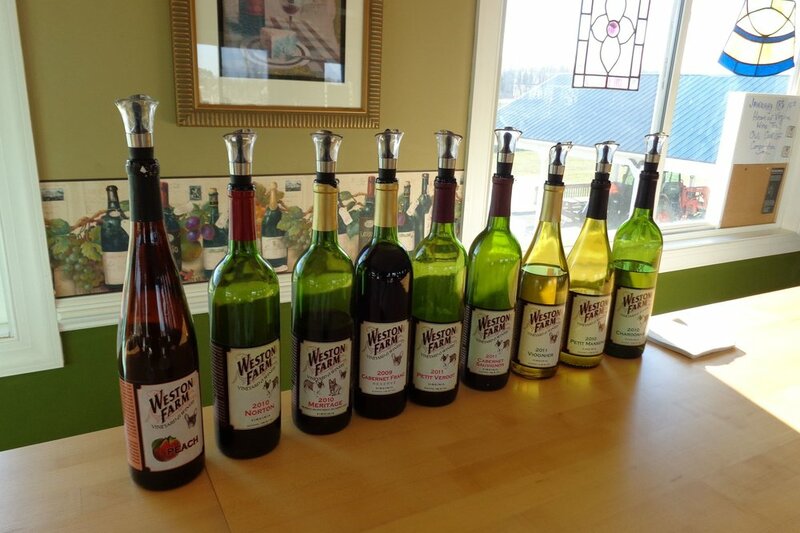 Fruit wines are typically easier. I finally admitted that I had no clue what Dean had just poured. “Elderberry.” he told me. Elderberry is the farm’s primary fruit crop. Very few American wineries work with elderberry and Brightwood is only one of three that make wine from the flower. In addition to the elderberry and elder flower wines, other fruit offerings included peach and blackberry. All were done primarily in a dry style and all had character beyond the fruit notes one might expect. All exceeded my expectations for fruit wine. They tended to have distinct grape-wine characteristics. There are future plans for a Mulberry wine. I can’t wait to see what Dean does with that fruit. Of course there are grape wines as well. I sampled a Traminette, but those vines have long since been replaced. Today Brightwood grows a number of hybrids. Among these you will find Concord, Norton, Beta, Warden and Muscadine. Dean did have a Warden available to sample. I had no previous experience with that varietal and found it to be a little bigger than Concord, but with a similar foxy profile. 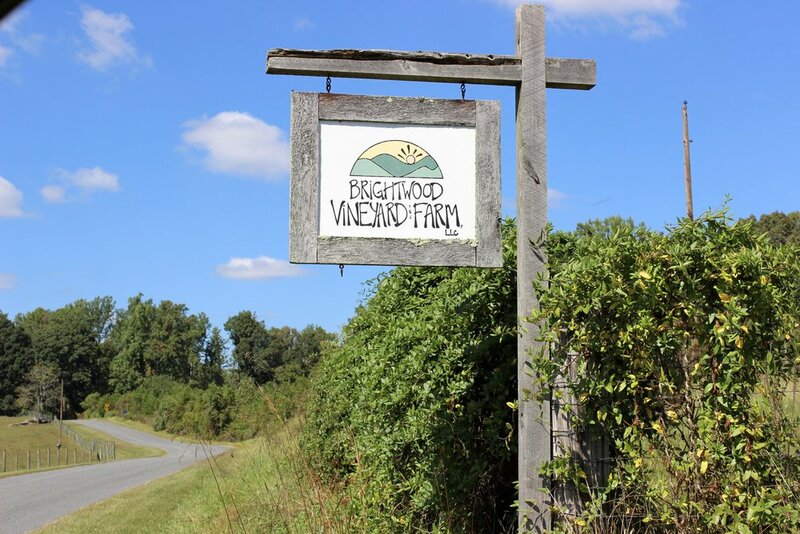 Any visit to Brightwood will include a very strong educational component, which includes a tour of the farm. So this is more than a tasting. Dean’s agenda includes promotion of organic farming and if a visitor seems interested, he will provide a short presentation. In the end, he asks you to “think deeply about” the rise of cancer, obesity and asthma that has accompanied increased use of pesticides. Dean is passionate without being overbearing and he loves to share the knowledge gained from his farming experience. It’s very well done and entirely worth checking out. In the end, I have to admit that this was a pretty non-conventional wine tasting. Nevertheless, it was a very fascinating visit. Anytime is a good time to drop in, but it’s necessary to call ahead. It is a working farm after all, but Dean loves to entertain visitors. If you really want to see the farm in all it’s glory, the elderberry blooms in late May or early June. Stop in and let know what you think. Despite the repeal of the Volstead Act in 1933, which brought the end of Prohibition, it was more than forty years before the first Virginia winery opened in the early 1970s. 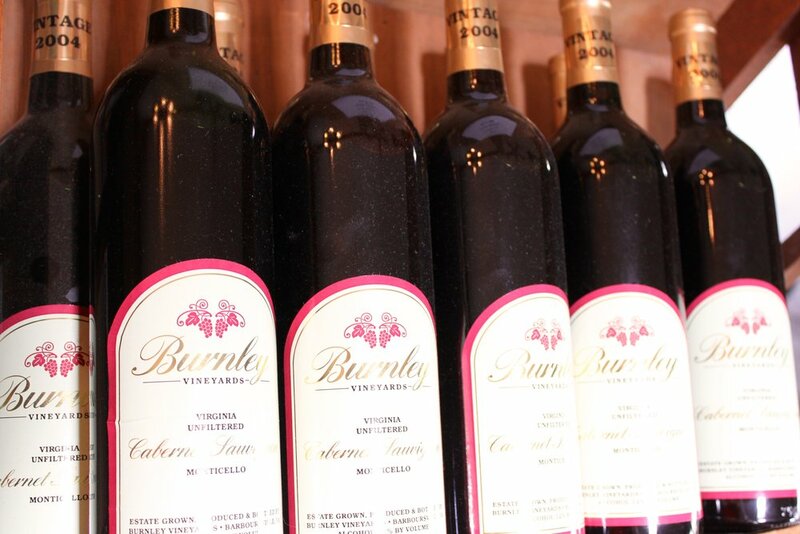 When Burnley Vineyards began planting in 1977, there were only twelve other wineries in the entire Commonwealth. Only a handful of he early Virginia winemaking pioneers are still around, but Burnley has hung on through the years and is now one of the state’s oldest wineries. 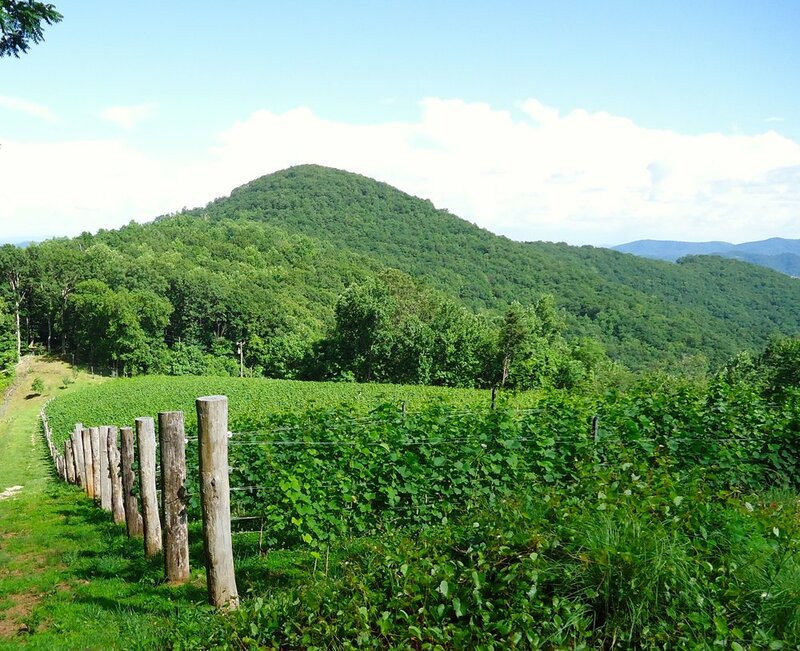 Burnley is in the Monticello AVA (American Viticultural Area) in the northeastern corner of Albemarle County and just a short drive from Charlottesville. It was here that C.J. Reeder and his family initially planted Chardonnay and Cabernet Sauvignon and began selling that fruit in 1980. In 1984 the Reeders opened Burnley and began producing wine under their own label. More grapes were planted over the years and today there are a total of 32 acres under vine. This enables them to produce about 5000 cases annually. Most of the wine is sold from the tasting room and at festivals, but Burnley also ships to 32 states. The winery building is quite old, but it is in good repair. A staircase leads up to the tasting room and from there you can look out over the vineyards and toward the mountains. Inside there is a long tasting bar and a second room that functions as an event space. It is quite cozy and the family and staff go out of their way to make visitors feel welcome. As such, I find it difficult to make a quick stop at Burnley. The tasting always turns into a lengthy conversation with the staff and other patrons. It is basically a social event and I have never noticed any inclination to rush visitors through the flight of wine. This is in stark contrast to many of the other nearby wineries. During my most recent visit, I tasted a dozen wines from the regular and reserve menus. The first three were whites. We started with a lightly oaked Chardonnay and white blend before moving on to the Riesling. I have to say that the Riesling was extraordinary and my favorite of the entire tasting. It was made in a dry style and was filled with tropical notes. It is easily one of the best Rieslings east of the Blue Ridge. The reds from the regular flight were primarily Chambourcin or Chambourcin blends, but the reserve flight contained some real, single-varietal gems. It included a Barbera, a Cabernet Sauvignon (from 2010 no less) and their signature Norton. I should point out that Burnley conducts a vertical tasting of Cab Sauv in March and Norton in August of each year. Both events are very reasonably priced and offer an opportunity to taste multiple vintages in a single sitting. 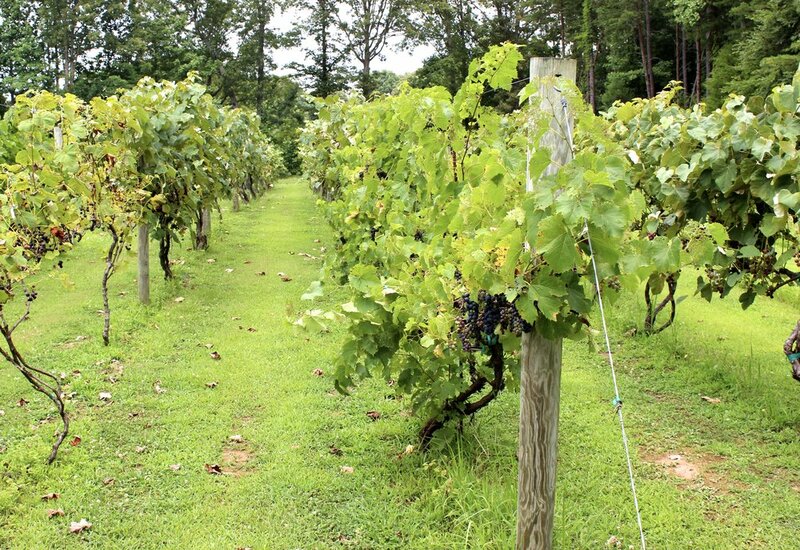 Burnley Vineyards is a must-visit for anyone exploring Virginia wineries. They have weathered many years in the industry and represent a piece of the state's winemaking history. If you have visited or if you make it out there, I am very interested to know what you think. It was one of those raw, rainy winter days and probably best suited for staying indoors, but I was determined to visit a couple of wineries and I’d been meaning stop in at Byrd Cellars Vineyard & Winery for some time. The winery is located roughly midway between Charlottesville and Richmond, on Route 6 in Goochland County. It sits on land that was once known as Rassawek, the primary city of the Monican Indians. Captain John Smith’s map of 1621 showed this as the site, situated near the confluence of the James and Rivanna Rivers, with a number of smaller Monican villages located nearby. 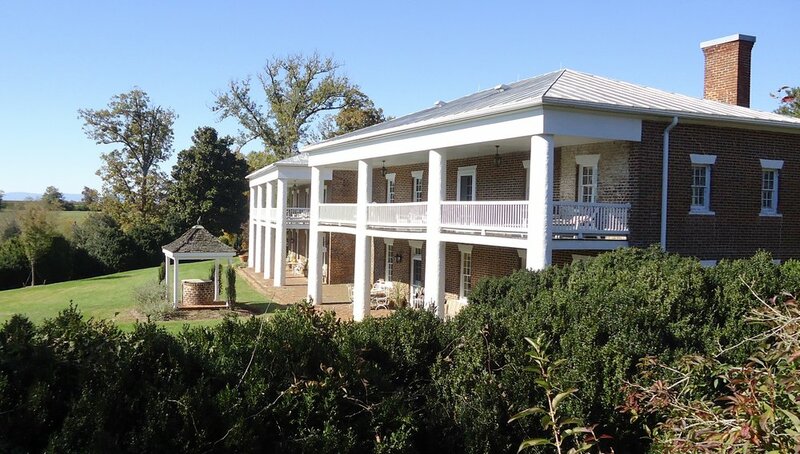 Today Byrd Cellars occupies part of this property that offers a commanding view of the James River Valley, Elk Island and the Virginia Piedmont. It’s a beautiful, rural area that is primarily farm acreage, but the sloping hills above the river also provide an ideal spot for the cultivation of grapes. Bruce Murray, the owner/winemaker at Byrd Cellars, planted his first grapes in 2003 and has about seven acres under vine. Bruce bottled his first vintage six years later. Unlike many new wineries, the plan was to give the vines a little time to mature rather than produce a marginal product after a couple years. Byrd Cellars produces about 1500 cases per year, so it is a small boutique winery. There are no plans to increase production and all of the wine is sold through the tasting room, wine club and local festivals. So for now, Bruce is successfully concentrating on making small-batch, quality wines. When I visited, there were eight wines on the tasting menu and Bruce brought out a sample of a ninth that had been bottled, but was still awaiting labels. The Byrd Cellars wines are not heavily oaked, so the fruit comes through in all of the offerings. There were only a small number of whites available for tasting. There were a pair of Chardonnays and an Apple-Concord. All were very interesting, but I really liked the lightly-oaked Chardonnay. There were hints of oak on the nose and palate, but it just rounded off the green apple tartness without disguising the fruit. I thought it was an excellent and balanced wine. The red wines included Syrah, Merlot, a couple of Cabernet Sauvignons and the Dahlgren’s Raid Red, which is a blend of Concord, Cabernet Sauvignon and Chambourcin. I thought all were well crafted and worthy of note, but I want to talk about the ninth wine, the one that is awaiting labels. The ninth wine was a Norton and every Norton I’ve ever tasted has a mid-palate acidity that might be muted with age, but never completely goes away. As a result, people tend to love or hate Norton. Well, they’ve never tasted this one. It had the typical, earthy Norton nose, so nothing seemed different. Then I tasted it. It was big and complex like a Norton, but without the astringent qualities. Instead, it had these very distinct chocolate notes and a beautiful finish. I was blown away. It was the best Norton I’ve ever tasted and I’ve tasted my share of that varietal. I typically take a small taste and pour out the remainder, but there was no wasting this wine. Bruce poured me a little more and I savored every drop. I will return after the labels are applied and take some of it home. My hat is off; two thumbs up; the winemaker nailed that one. You’ll be pleased to hear that Byrd Cellars engages in a number of environmentally friendly practices. They reuse their bottles and charge a fifty cent deposit on each one to encourage customers to return them for the refund. They additionally use biodegradable “zorks,” an Austrian-developed cork alternative. They use only fungicides, but no pesticides in the vineyard. The vineyard has a micro-drip irrigation system and all wine solids are composted for reuse in the vineyard. Depending on the season, Byrd Cellars provides a number of incentives for visitors to hang out in the tasting room or out on the deck. In cold weather, there is a big wood fireplace and mulled wine is available at the tasting bar. In summer they serve sangria and wine slushies. Alternatively, one can always take a picnic and relax on the hillside above the James. I always point to the refreshing qualities of visiting these small, family-owned wineries and Byrd Cellars obviously falls into that category. You invariably get to meet the owner or winemaker (or both) in the tasting room, so accurate wine knowledge is passed on and the owner or winemaker’s enthusiasm is frequently contagious. The staff is always invested in the experience of each patron and that was true at Byrd Cellars. I had a great visit that included a lengthy discussion with the owner/winemaker and a tasting that was relaxed and enjoyable. What more can you ask for? Even on a raw, rainy winter day, Byrd Cellars is worth a visit. A drive along Route 151 through Nelson County will take you past some of the best wineries in Central Virginia. Just east of 151, tucked up in a narrow mountain valley, you will find Cardinal Point Vineyard and Winery. It’s a beautiful venue and decidedly less remote than it feels. I’ve visited Cardinal Point many times and return at least annually in November for their Oyster Festival, which is one of the area’s premier winery events. Their calendar contains a number of smaller public events, many of which benefit area charities. On the afternoon of my most recent visit, there was music on the patio and a small crowd lounging with a glass of wine. The winery has a very loyal following and even on a winter day, there was a steady flow of patrons. During his career in the Army, Paul Gorman was stationed in Germany, where he and his wife Ruth lived in one of the many wine regions. While there, they were surrounded by vineyards and exposed to the European wine culture. This was the catalyst. After retiring, the Gormans settled their family on the Nelson County property and in 1986 they planted their first vines. Initially, they sold their fruit to other local wineries, but transitioned to wine production with the bottling of their first vintage in 2002. Today, Cardinal Point is a small, family-run, boutique winery. Their son Tim has assumed duties as winemaker and daughter Sarah oversees day-to-day operations as the business manager. With fifteen acres under vine and additional grapes purchased within the AVA, the winery has settled in at about 3000 cases of wine each year. In the early years, Michael Shaps was the consulting winemaker. Shaps just happens to be one of Central Virginia’s winemaking superstars. This established a tradition of innovation and world-class wine creation that has endured. After Tim Gorman earned his degree in enology from Virginia Tech and took over the reigns, the quality of the wine continued as did the reputation of Cardinal Point. Knowing this, I was excited to taste the current offerings. On this particular day, Cardinal point was pouring six wines. I am a big fan of the A6, which is a blend of oaked Viognier and stainless steel Chardonnay that is named after the Autoroute A6 that runs through multiple French wine regions. It contains all the fruit notes from each of the varietals, with a very crisp finish. It’s a lovely wine. My favorite wine on the menu was the 2012 Clay Hill Cab Franc. This is something of a reserve wine, with grapes from Clay Hill Vineyard in Ivy, and one of the first examples of a 2012 red I’ve tasted. It was showing well, which may be a good omen for other wines of that vintage. It had all the typical Cabernet Franc red fruit characteristics with a bit of complexity. This is an exceptional wine that will only improve with age. The tasting experience at Cardinal point is first rate. The room, which opened in 2003, is small, but well laid out and the tasting bar will accommodate a fair number of visitors. The staff is customer-oriented and informed and the winery is both child and pet friendly. Henry Graff, a local news anchor, was pouring wines during my visit. He’s been helping out in the tasting room for about three years and was able to discuss each of the wines in great detail. I was also lucky enough to sit down for a conversation with Sarah Gorman, who filled me in on the winery’s back story and business plans. I mentioned Cardinal Point in my “Best of 2013” post and I will feature it again this spring in a "great picnic venue" post. The hillside above the winery offers a great view of the valley and is an excellent spot to roll out a blanket and enjoy a light meal. This has been one of my go-to wineries for many years and I encourage you to stop in. Cardinal Point is a beautiful venue with great wine and an amazing staff. Can you ask for more? I have officially discovered cider. Recent experience and a couple cidery visits have taught me a little bit about this fermented beverage. Of course, there is always more to learn, but one has to start somewhere. So most recently, I stopped by Castle Hill in Keswick. This is horse country, which obviates itself during the drive along Route 231, as it winds along the eastern slope of the Southwest Mountains. After turning onto Turkey Sag Road the horse-country vibe intensifies as you approach Castle Hill with its white picket fences and green pastures. The stable design of the main building adds to the atmosphere. Inside you will find the tasting room, an event space and the cidery. In a word, this acreage is stunning. The property has been devoted to horses and agriculture since the mid-eighteenth century when it was part of the massive Thomas Walker plantation. Walker was a contemporary and mentor to the young Thomas Jefferson and established the estate in 1764. Castle Hill represents a piece of American history and is worth visiting even if cider is not your thing. Inside at the tasting bar, I met Cellarmaster Geoff Robinson, who just happened to be entertaining friends from out of town. He took a few minutes to answer my questions and show me around. I learned that, unlike wine, cider is produced year round. The apples are refrigerated and processed as needed. In fact, cold storage adds to the juiciness of the fruit and actually produces better cider. A second major difference between cider and wine is the pasteurization process, which helps preserve the final product. I had earlier been told that pasteurization can cause sweetness in cider, which is incorrect. If it is over pasteurized, the fruit will cook causing applesauce notes, but that should not be confused with sweetness. Rather, it should be associated with poorly-made cider. All eight of the Castle Hill ciders were available for tasting. They are primarily dry-style of off-dry ciders made from Virginia Winesap, Albemarle Pippin, Black Twig, English Bitter Sweets (a type of crabapple) and Grimes Golden apples. I can say quite candidly, that I enjoyed every one of the offerings, but there were two that really jumped out at me. The Terrestrial is sparkling and full of acidity. This blend of Winesap and Pippin displayed distinct Cava characteristics. The Celestial Merret was another sparkler and my favorite. It is processed in the traditional method and contains many of the attributes of a fine sparkling wine. I took some home. I would be remiss, if I did not mention the Levity, which is made entirely from Albemarle Pippins and is fermented in Kvevri, which are clay amphorae that are buried in the ground. Kvevri are used for winemaking in the Republic of Georgia and considered to be the oldest winemaking method in the world. With regard to cider, it produced a layered earthiness and added levels of complexity not present in the other offerings. So aside from amazing cider in an absolutely breathtaking and historical setting, I am not sure what else Castle Hill has to offer. Does there need to be more? Even if you are an unabashed and unrepentant oenophile and know nothing about cider, I think you should visit. It is an eye-opening experience. The ciders are complex and infinitely well crafted. You could do much worse. On the other hand, if you are a cider fan, this is a no brainer. Stop in and when you do, let me know what you think. The northeastern corner of the Central Virginia seems rural, remote and slightly removed from the rest of the wine region. Indeed, Chateau Merrill Anne is that corner's one lone winery. Of course, being remote from Richmond or Charlottesville isn’t a useful perspective. Most of the tasting room traffic comes from Fredricksburg or the Lake Anna resort communities. The nearest neighboring wineries are actually in Northern Virginia. As of this writing, Chateau Merrill Anne is very new. They just opened in 2014. Kenny and Emily White are still getting their legs under them, but with the assistance of Michael Shaps they will be producing between 600 and 800 cases of wine annually. While Shaps is currently making all of the wine, there are plans for on-site production. Kenny cut his teeth making wine for personal consumption prior to procuring a farm wine license. So it’s coming soon. The Whites will release an estate-produced Chambourcin in 2015. The red clay soil in this section of Orange County is not ideal for cultivation of international varietals. There are a few, but primarily French-American hybrids make up the 4.5 acres under vine at Chateau Merrill Anne. Grapes like Cayuga and Norton are better suited to the terroir. Acreage has been leased in other parts of the state to supply the majority of French vinifera necessary to round out the wine list. There were ten wines on the list when I visited. All were well crafted, exceptional wines. This is surprising given the age of the winery, but lets not forget that Michael Shaps had a hand in this and he is not known for bad wine. Among the whites, there was a Chardonnay blended with a bit of Cayuga. It had nice texture and aromatics, but right out the gate, the Palace White was my favorite. This blend of Seyval Blanc and Cayuga had crisp tropical notes and a crazy-long finish for a white. It was a refreshing wine that just begs to be opened with or without food. Among the red wines, there was the Palace Red, which is a blend of Chambourcin and Merlot. It was interesting and captured the best features of each grape. There was also a very nice Cabernet Sauvignon, but my top pick of the tasting was the Governor Spotswood Red. This Bordeaux blend of Merlot and Malbec was full of rich fruit and structured tannins. Oh, and the finish just blew me away. It’s a potential award winner. Even though these are early days at Chateau Merrill Anne, there seems to be a real commitment to keeping production low and placing emphasis on the crafting of quality wine. In addition to the wine, the tasting experience is first rate. The owners are always present in the tasting room and give personal attention to each visitor. I found it educational, but the personal touch really set the tone. I see big things on the horizon for this young winery. So what are you waiting for. Make Chateau Merrill Anne a stop on one of your wine adventures. See for yourself what’s going on and let me know what you think. The area around Barboursville, Virginia is home to some of the state's most iconic wineries. One more can be added to that list. In an effort to keep up with all the new wineries that have opened in the last year, I paid a visit to Chestnut Oak Vineyard. It turned out to be a pretty exciting new discovery. I must be slipping. I drive out Route 20 through Barboursville all the time, but I have never noticed the grapes, which were planted in 2007 and are within easy sight from the road. There are a total of seven acres under vine, which is a bit hard to overlook. According to the owner, Janet Bolla, there are plans to expand the vineyard by another five acres. So keep your eyes open as you drive out that way. If you're paying attention, you can't miss it. Chestnut Oak received a farm winery license in 2009 and released its first vintage that same year. Until 2013, when the new winery tasting room was constructed, Michael Shaps made the wine. Today, David Eiserman, who was described by Janet as "a young American wine Enthusiast," has taken over vineyard management and wine production. He is using exclusively estate fruit. So he is working with Petit Manseng, Viognier, Cabernet Sauvignon, Merlot and Petit Verdot. Nebbiolo was planted in 2015, so that should add a bit of excitement to the lineup in a couple years. In any case, David is doing a splendid job in the winery. Seven wines were being poured. The goal is to produce the highest quality wines and it shows. Three vintages of the Petit Manseng, a Rose and two vintages of Cabernet Sauvignon. I must say that I love a vertical tasting, so I am always pleased when I encounter one in a tasting room. The Petit Mansengs ranged from honeyed with a hint of residual sugar to bone dry with stone fruit notes. I genuinely enjoyed each in turn. I will say, however, that the Cabernet Sauvignons were the standout for me. The 2009 was drinking well with beautiful cherry notes and a bit of complexity, but the 2010 was absolutely stellar. It had a big nose that was full of red fruit and it was bigger, even jammier, than the earlier vintage. It is a great wine and a potential medal winner. I must point out that the entire tasting experience is first rate. Chestnut Oak is not using gimmicks to drive customers to the tasting room. It is just a very low key, comfortable tasting room. The service is excellent and my wine steward was both professional and engaging. In the end though, the wine is the real draw. Sadly, Chestnut Oak only produces three or four hundred cases of wine each year. On occasion, you may find these wines in various restaurants and retail outlets around Charlottesville, but you probably need to drive out to the tasting room. Its location near other great wineries makes it even more likely that you'll be in the area, but do make an effort to stop in. This is a winery with a bright future and you need to check them out. After your visit, let me know what you think.